Well, I am delighted to be able to say that much more has been done by the Federal Parliamentary Labor Party ‘to assist working people and union organisation’, because it has already elected Mark Latham as its Leader. Polls are now proving that the Federal Parliamentary Labor Party can defeat the Liberals at the next election. Gough Whitlam supported my view that Mark can win greater, electoral support for Labor than Kim Beazley, who was a Minister in the Hawke/Keating Governments which privatised the people’s Commonwealth Bank, floated the dollar, deregulated the financial industry, lowered tariffs and sold a whole list of other assets belonging to all of our people. So, if Mark can get his Parliamentary colleagues to return to basic Labor principles, the Federal Party will certainly win back the army of battlers who have already elected Labor to office in Queensland, New South Wales, Victoria, Tasmania, South Australia, Western Australia, the Northern Territory and the Australian Capital Territory. During the whole of the 31 years I was a Member of the FPLP (1949–80), no one in Caucus or in the Whitlam Government ever proposed that Labor should sell the Commonwealth Bank or any of the other publicly-owned assets that were privatised during the period Hawke and Keating were in Government. Nor did anyone in Caucus or in the Whitlam Government ever suggest that the Government should give foreigners the power to fix the rate of exchange on the Australian dollar. No one in the FPLP ever took steps towards allowing an uncontrolled inflow of foreign capital that would allow foreigners to capture ownership of Australian assets. Nor did any member of the FPLP ever give the slightest hint of support for a reduction of income tax on Company profits or upon individuals in receipt of very high incomes. No Minister in the Whitlam Government ever proposed a Wages Accord that would result in a reduction in real wages for lower and middle-income earners. Yet, while the Hawke/Keating Government held the reins of power it made all of the following departures from true Labor principles. Privatised the Commonwealth Bank and other-publicly-owned assets. Allowed foreigners to fix the rate of exchange on the Australian dollar. Allowed the inflow of foreign capital so that foreigners could capture ownership of Australian industries. Reduced the income tax on very wealthy Australians and company profits. Introduced a Wages Accord that reduced the real wage of all the lower and middle-income earners. Keep fresh and green the memory, the example and the experience of the late Ben Chifley, by totally opposing the policies of the Liberals to privatise, in whole or in part, Australian Airlines, Qantas, the Commonwealth Bank, Telecom. In the same year, Prime Minister Hawke’s Treasurer, Paul Keating, put Labor’s opposition to selling publicly-owned assets in proper perspective by making the devastating declaration that to privatise the Commonwealth Bank, TAA and other public assets: ‘is simply vandalisation of Australia’s greatest assets’. Crean and Kelty agreed with the Treasurer’s diagnosis and felt there was no other way to go than the broad-based consumption tax route. They said they were prepared to go out and sell hard, a saleable package, including seeking an agreement on discounting. They agreed that the Treasurer’s proposal provided basis for such a package. They noted that they had fought hard to keep the options alive during the election; but their constituents were now starting to become a little restless; in part, because of the lack of firm options on the Table. One might therefore ask: Why did Simon persuade the Special National Rules Conference which met in Canberra during October 2002, to alter the Rules by reducing trade union influence in the Party it established in 1891 to only 50 per cent? The Labor Party began to lose its way from 1967 onwards when the politicians succeeded in winning the right to send a total of ten unelected politicians to the National Conference with full voting rights. Then they seduced the factional leaders into increasing the number of delegates from 46 to 189. But hold it! the number of delegates who will attend next year’s National Conference will be 400! Only half of whom will be representing the workers who formed Labor Party in 1891. My guess is that a large number of the non-union half of Conference delegates will be politicians; and those who are not politicians may have their fares and hotel expenses, etc, met by those wishing to buy their votes for the policies being advanced by the political head-kickers. So, with the smiling support of the Liberal Opposition, the FPLP Government then sold the publicly-owned Australian Industry Development Corporation (AIDC), in 1989–90; AUSSAT (which provided satellite for TV and radio) 1989–90; Commonwealth Bank 1991–94; Australian Airlines, 1992–93; Commonwealth Serum Laboratories, 1993–94; Moomba-Sydney Pipeline System, 1993–94; Qantas, 1995–96; plus the planned sale of the Airports, 1996–97; and the Housing Loans Insurance Corporation, 1996–97, to the profiteers of private enterprise at bargain prices. Examples of the give-away prices accepted by the Government were: the first tranche of Commonwealth Bank shares were handed over to buyers (including one of the Ministers) for a mere $5.40 a share which reached $32.90 on the Stock Exchange earlier this year. In the case of the Commonwealth Serum Laboratories, its shares were sold for $2.30 a share; and earlier this year reached $30.00 a share. But two and a half years ago, they reached $34.00 a share on the Stock Exchange. I know that several Labor Ministers and many members of Caucus were very unhappy with the Hawke and Keating Government’s decision to privatise the Commonwealth Bank and other publicly-owned assets. It was also bitterly opposed by the Trade Union Movement. The average salary of Australia’s top one-hundred Chief Executives has topped $2 million for the first time — 38 per cent higher than last year. That is $38,461 per week— about 85 per cent of the annual wage… It means that the average top one hundred CEOs’ salaries have gone from 34 times the Average Weekly Earnings in 2001, to 44 times this year. In fact, Australia has not had a Minimum Wage calculated on an analysis of household budgets, since the Basic Wage derived from the original Harvester Budget was abandoned in 1967. I now refer to the enormous cost of TV commercials during election campaigns. The total cost to both Parties in 1996, was $150 million which has made them beholden to the Big End of town. In 1975, Bob Hawke, the ACTU President, condemned the huge donations paid to the Liberal Party to help it overthrow the Labor Government elected by the people. Fortunately, there is a simple solution for remedying the cost of such commercials which have become such a telling ingredient towards political corruption. This was spelt out by Dr Evatt in 1956, when the Menzies Government opened the door for the licensing of commercial television. Evatt’s amendment, which was unanimously endorsed by the FPLP Caucus, made it a condition that such a licence shall carry the requirements that: ‘Political and industrial controversy on matters relating to current policies shall be free of charge and on an equitable basis’.16 When moving his amendment, Evatt made the compelling point that the airwaves are the collective property of all the Australian people; and as such, the people have the right, and the duty, to demand that a condition of a television or broadcasting licence to use their airways shall include the proviso spelt-out in his amendment. I sat through the whole of that debate and never heard Evatt handle any issue with greater logic. At my instigation, the South Australian Branch of our Party urged the National Executive to request the FPLP Government to implement the Evatt amendment. But I was told it was opposed by the Democrats, thus forcing the Government to opt for a complete ban on political commercials. The amended Bill when carried, went on appeal to the High Court with the claim it was a denial of free speech, and was declared to be ultra vires the Constitution. But Dr Evatt’s amendment was not a denial of free speech: It merely demanded that ‘free speech’ be free of charge! While I was State President of the Labor Party in South Australia, the total cost of our 1947 state election campaign was only £1, 100. every penny of which was donated by our affiliated trade unions. Therefore, we owed no favours to big business and the media barons. When the Corporate Sector gives a Party a million dollar donation to its Campaign Fund, it expects to get ten million dollars in tax and other benefits, which is something a Labor Government has never done. That’s why I told Gary that when the Corporate Sector gave Labor a $67 million donation towards it elections campaign, it expected to get $670 million in tax concessions and other benefits. Gough was, indeed, the best Leader of the FPLP since Ben Chifley! His Government gave Australia Medibank, free University education, and ended our involvement in America’s war against Vietnam. And, he never repudiated Labor’s deep commitment to democratic socialism. When one remembers why Labor established the Commonwealth Bank, and understands why the Tories were opposed to it, I find it hard to ever understand why the FPLP sold it! Was it due to an ignorance of Labor history or was it due to the crass stupidity of their bureaucratic advisers? If these were not the reasons, was there some sinister motive for such a base betrayal of Labor’s proud record of past achievement? I repeat, it was not the trade unions who advocated the tragic mistakes made by the FPLP Government. Labour’s battlers did not desert Labor. It was the Federal Parliamentary Labor Party that deserted the battlers! Fortunately for the ALP, Labor voters now see two quite different Labor Parties; One is the Labor Party that now governs in Queensland, New South Wales, Victoria, Tasmania, South Australia, Western Australia, Northern Territory, and the Australian Capital Territory. The other is the failed Federal Parliamentary Labor Party that has suffered its third successive defeat and its lowest primary vote for sixty years. I repeat: Unless it confesses to its past mistakes and gives a solemn undertaking to never again depart from basic Labor principles, its defeats will continue.If that is not done, voters will have every right to suspect that a future Federal Parliamentary Labor Party Government may repeat the unforgivable mistakes it committed between 1983 and 1996; and, the drift of traditional Labor voters to other Parties will accelerate! We must always remember it is always better to confess to an error than to go on living a lie. 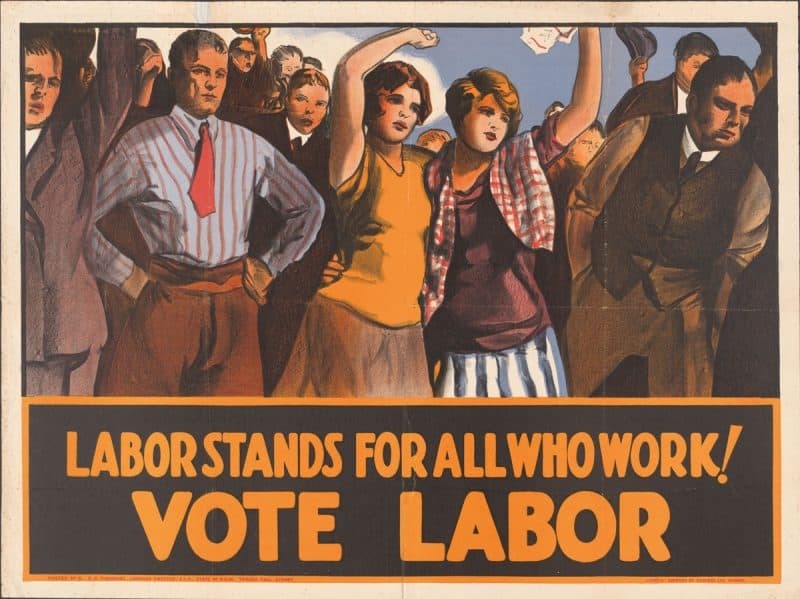 We now see the beginning of the end of the Federal Parliamentary Labor Party as we once knew it; and there is a huge gap separating the Federal Parliamentary Labor Party from the Labor Party in all States and territories; which I repeat, is not the fault of the Trade Union Movement. It is untrue and quite unfair, for some of our FPLP politicians, to blame the trade unions for the disastrous decisions made by their Government during its term of office. Kim Beasley (Senior) correctly identified the reason for the decline of the FPLP when he declared: ‘It turned its back on the cream of the working class in its rush to embrace the dregs of the middle class’. I conclude my address on the note that, in spite of what has happened to the Federal Parliamentary Labor Party, we still have a really great Labor Party in every state and territory; and in Tasmania and Victoria, Labor now holds a majority of Seats in the Legislative Council for the very first time in history. I know this will find every non-Liberal voter in the Commonwealth, continuing to use his or her vote to keep it that way. 1.Australian Options, Spring 2003, pp. 4–5. 4.Sydney Morning Herald, 10 June 1974. 5.This Day Tonight broadcast, 22 August 1974. 7.Sydney Morning Herald, 1 July 1974. 9. John Edwards, Keating: the Inside Story, Viking, Ringwood, Vic, 1996, pp. 270–271. 12. Clyde Cameron, The Cameron Diaries, Allen & Unwin, Sydney, 1990, p. 867. 13. Alan Kohler in Australian Financial Review, 6 November, 2002. 14.News Weekly, 22 March 1997. 15.Sydney Morning Herald, 15 May, 1975. 16. Hansard, House of Representatives, vol.10, 19 May, 1956.